The AWCRRHS descended on the layout today to operate the Aquia Line. Nine operators showed up plus Joel Salmons, who was the assistant superintendent. We ran three trains at once. They included 7 and Extra 7 from Aquia Landing and Train 8 from Falmouth. Train 8 actually was scheduled to depart first at 1:40 and it did. 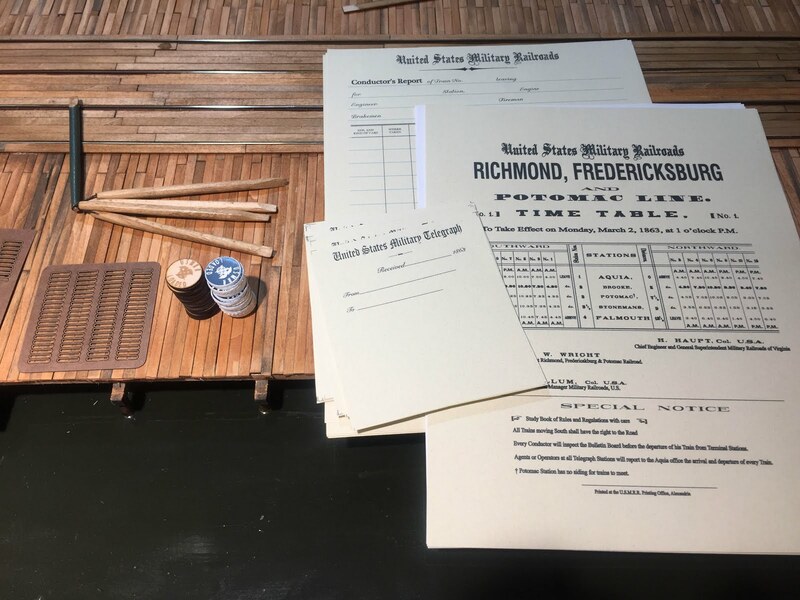 It was under the command of Thom Radice (NJ) as conductor, Mark Richardson (CA) as engineer, and Paul Dobbs (TX) as brakeman. Don Ball (KS) conducted Train 7 with Larry Huber (CA) as brakeman and David Bjorkman (NC) engineer. 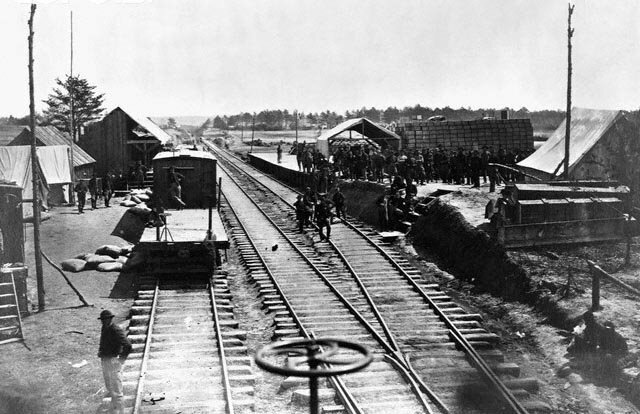 Extra 7 under the command of DC Cebula (DE), with John Salmons(VA) as brakeman and John Ott (CA) as engineer. Yes, the crews came from all over the Unted States. This was the first time we ran an extra train. With 3 man crews, it got very crowded in the layout aisles. But, since we had visitors from so far away, we wanted everyone to be doing something and have no one waiting around. Ideally we will use 2-man crews, especially if we run an extra. Otherwise, the extra worked really well. It gave the conductors a bit more to think about as they ran the trains. When both extras were at Falmouth, the aisle got really crowded, but the crews made it work. The loaded-empty tokens worked well. But, I think I will have the crews remove the tokens once they record the car to their switch list. While the ops session was under way several observers stopped by. They included Drew Hyatt (PA), Ray Bracis (OH), Ron, Jon and Lori Flowers (MI). Angela Richardson, Mark's wife was here too. Later Doug Gurin stopped by to pick up his shirt. Overall, the session was a success. Some brakeman had trouble with the links disappearing in the couplers. I think I will go back to the link design with the central bar. That prevents the links from going in too deep. All the engines ran great. There were a few derailments, but nothing too serious. Prior to the session, I modified the schedule to show Clozet Tunnel. (Yes that is the new name for the tunnel. Pronounce it Clow-zay. It a pun on the actual Crozet Tunnel and the closet). That seemed to work well too. There is a video of the session here. I think everyone had fun as they said they want to come back. After the session, Joel Salmons went up to the car to get his sawzall. He and the rest of the gang were ready to tear out PoLA and expand the Aquia Line. Luckily, I caught them in time before any damage was done. Actually they are on a UPS truck to my house update- are on hand now. These are special shirts reserved only for those that have helped build the layout. The op session for the ACWRRHS starts at 1300 tomorrow. I expect a big group. Then at 1500 it switches to an open house for the ACWRRHS members that don't want to operate. I had a busy week, despite catching a cold. First, I tweaked track by test running both battery and DCC powered locos. I found a few spots that needed adjustments. I have learned that the most problematic aspect in my turnout construction is where the point rails bend at the frog. That bend has to be made very precisely. I have found that the portion of the point rail that is adjacent to the frog can be set a bit loose without hurting performance. But the guard rails opposite them on the stock rails must be spot on. They need to be set right to the gauge so that the trucks don't pick the frog, but not too tight that the pinch the wheels. I also drove more spikes, so there is probably only 6 feet or so of track left to spike. I finished building 6 more cars, 4 box cars and 2 flat cars, thanks to some pre-assembly work from JB Weilepp and Paul Dolkos (see photo above). I painted these box cars medium gray, which looks good when paired with my other burgundy and tawny brown colored cars (sounds like a wine tasting, bring your own crackers). All these cars have home-made cast metal trucks, so their brakes do not operate. That makes 21 cars so far. I think 30 to 36 is a good target number. I have three more "kits" ready to build. Then I want to make some peaked roof box cars, which will require some new laser drawings. I went on a coupler height adjustment campaign too. When backing cars, coupler height is critical. When the couplers are mismatched height, the links jam and cars derail. As long as the couplers push face to face when backing, they run well. I also swapped the factory installed couplers on the locos with my own photo etched versions, as mine work better when pushing. I also cleaned the pickup wheels for my locos, ... but then, I swapped the battery power supply for Whiton with one of the new designs. The new BPS uses track power to power both the motor and the battery recharger. The battery only kicks in when the track power is off. In other words, it is the mother of all keep alive circuits. I did a test and sure enough, the new BPS can run the decoder off track power even without a battery. With this BPS and the old battery, Whiton now has been running near perfectly. With the new BPS system, one can use a smaller battery, which will make future installations much simpler. I am now seriously considering converting all the locos to the Stanton battery system. Wait, didn't you just wire the whole layout for DCC? Why not just just DCC decoders with keep a-lives capacitors? Haupt has such a keep alive circuit with regular DCC. For some unknown reason, it will stall every now and then. The Stanton battery locos don't stall. They even chug through the occasional short that happens when my brass locos touch wheels to frames on my tight curves. Yes, as much as I tweak the engines they do still happen. A last item, I modified the timetable a bit to try to pack in a bit more action. One of my testers from last week suggested I run fewer cars in the trains fro new operators, so we will try that. 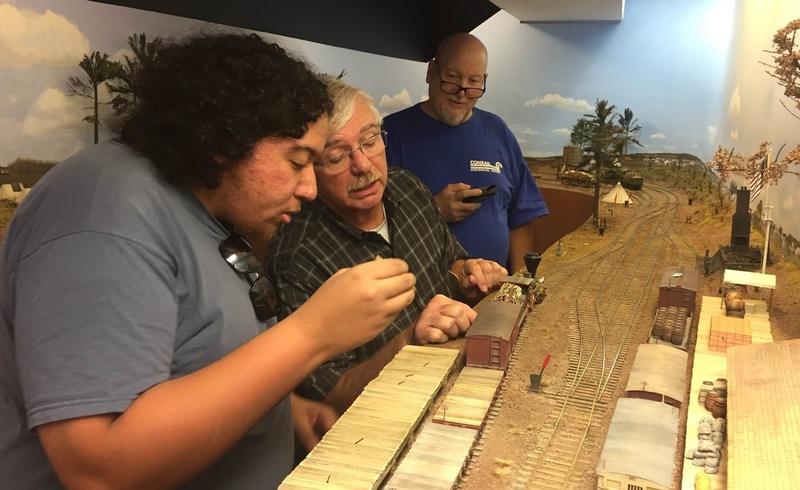 For those unfamiliar with concept of a model railroad operating sessions, here is a brief explanation. The hobby of model railroading has many facets. Like other modeling hobbies, we get to build models. Not just of trains, but also the structures they serve and scenes through which they traverse. But building is only part of the fun. We also get to operate the trains, and not just in circles around a Christmas tree. Our operation tries to simulate what the actual railroad would do. In effect, we use our models to play a simulation game. So instead of gathering dust on shelves, our models come to life. The human element introduced by the operators (or players) greatly expands the enjoyment of the hobby. With that background, lets talk about today's operation session. This was the first test of the Aquia Line model railroad. The PoLA layout had already been operated 9 times before, so it was well tested. For over 24 years I worked in the defense business doing operational testing of military systems, especially Army combat vehicles. I worked on systems like the Abrams M1A1, M1A2, Bradley M2A3 and the Stryker. So it seems appropriate to run the first operational test of the Aquia Line like a military operational test. One of the main tenets of operational testing is to use real soldiers for the test, not engineers or highly qualified "golden crews." Also, the test needs to take place in a realistic environment. To achieve those aims, I wanted some operators that were new to the layout, as well as some "old hands." To make it a realistic environment, and to maximize stress on the system, we ran PoLA as well as the Aquia Line at the same time. Since they feed off the same Easy DCC system, albeit with separate boosters, this was a realistic operational environment. Three man crew on train 8 went smoothly. The test participants included Paul Dolkos and John Barry on PoLA. They are both experienced operators, so I assigned them to PoLA since PoLA didn't need to be stress tested. especially with all the bell and whistle tasks. On the Aquia Line we had two crews. Train 7 with engine Haupt originated from Aquia Landing under command of John Drye as the conductor/brakeman with Doug Gurin as Engineer. 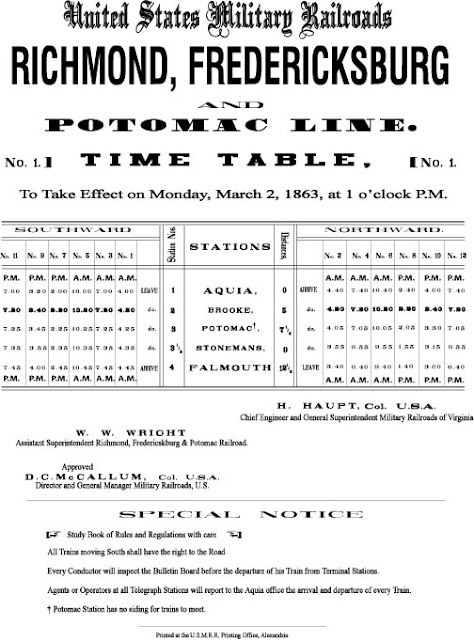 At the same time, Train 8 with Fury originated from Falmouth under command of Joel Salmons, with Jeff Peck as Engineer, and Christian Peck as brakeman. The op session stated at 1400 instead of the normal 1300, so both trains were late at the start at the start of session. That's not a big deal and actually meant less time waiting. However, both crews took about 45 minutes to get their trains out of the originating stations. Train 8 had to turn their engine on the turntable, then build it. Some of their cars were buried behind loaded cars and had to be dug out. The crew of train 7 was having a hard time adjusting to the link and pin couplers. The conductor forgot his reading glasses and could not see what he was doing. I eventually took over brakeman duties on train 7 and that helped get things rolling. Lesson learned - bring young eyes or reading glasses to operate. Each crew got to run a train in both directions on the layout. By then 2 hours had passed and we called an end to the session. The results of the test were generally favorable. The crew on Train 7 felt that they were very busy and could just barley keep up with all the tasks. They recommend running smaller trains. They started with 4 cars and picked up a few a dropped off some. The crew on Train 8 said everything went smooth. Train 7 had trouble with both engines Haupt and McCallum. They started with Haupt and switched to McCallum. I tested Haupt separately and could not find a problem. That's Murphy for you. The process of randomly deciding if loaded cars had been unloaded and thus ready for pick-up worked pretty well. Crews flipped coins. Only one car never got picked up, a box car at Potomac Creek. It survived two coin flips. I am considering adopting the 4-cycyle waybill system for the cars in addition to the random process. Most of the crews did not read the instructions or bulletins before the session. It's too bad, as some of their questions were covered in them. One problem overall was the lack of freight cars. I only had 15 in total. When Train 7 left Aquia Landing, the yard and wharf was totally out of cars. In an ideal situation, there would be cars left at Aquia for the next train to take out. Instead, during today's session, I had to re-stage the cars that came to Aquia Landing on 8 as soon as they arrived. There are 6 six cars now in partial states of assembly to help resolve this shortage, thanks in part to JB Weilepp, who brought another to the house today, but he couldn't stay for the session. Paul Dolkos suggested that the PoLA switch list include cars that are on the layout, but are supposed to stay in place, these are called hold cars. On my switch lists, I only list cars that they have to pick up or set out. My suggestion was to make notes on the switch list of the hold cars so they know where to put them back if they move them. That seemed to satisfy Paul, though he claimed that is not how the prototype does it. I use the hold cars to adjust the complexity of the session. If I know the operators are experienced, I put more hold cars on the layout to get in the way. Since Paul and John are very experienced, I used several hold cars. For newer operators, I remove the hold cars. It took Paul and John about 2 hours to work PoLA today, so you know it was a more complex session. Most importantly, everyone said that they had a good time. That may be because they finished all the chocolate chip cookies that Alicia baked for them. Thanks to my testers for coming today. And thanks to Alicia for making cookies and other help. Here is the timetable we will follow for the first ops session. 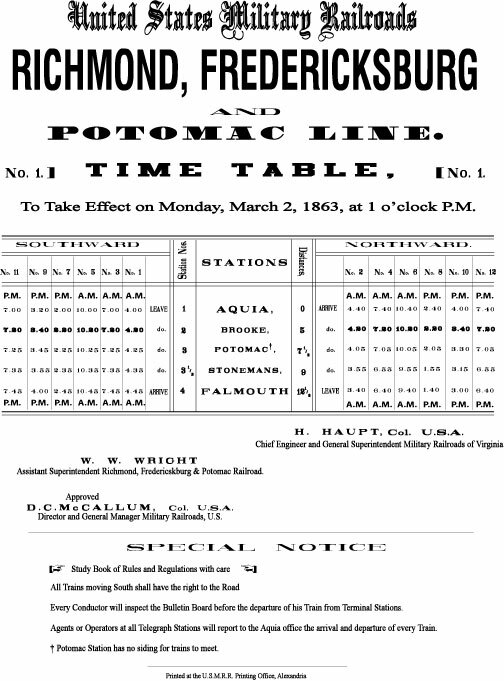 This timetable follows the prototype except that it has trains starting from Aquia and Falmouth at roughly the same time. In preparation for the first operations session Saturday, I've been thinking about how the layout should operate. I want to avoid using car cards and way bills. I do plan to use switch lists and train orders. I have come up with an idea for a random pick up of cars, which is detailed below. The latest versions of these instructions can be found on the page of instructions and bulletins. Visitors should always check that page before operating to learn of the latest developments and bulletins. The idea for layout operation involves a random process to determine if cars are empty. The random concept is based onto fact that this is essentially a one-way railroad. Most cars leave Aquia Landing loaded and return empty. Cars that move loads in the opposite direction are special cases and will be covered by specific train orders. Haupt also insisted that cars be unloaded promptly. If you study the conductors' reports, you see that most cars went out and returned on the same day, though some did stay overnight. I haven't decided if we need to have a third crew work at Aquia Landing. It would just act as a station switcher. We'll see how the first test op session goes. A friend asked how far along my layout was. I had not looked at the overall numbers in a while, so I did an update. See the chart below. Note that most of the major construction is done. I now need to add cars to the rolling stock fleet and finish the detailing of Aquia Landing. Ohm my word, it finally happened. I finished wiring the tracks to the Aquia Line. There were a few glitches along the way, such as I forgot to gap the turnout on the wharf, that caused a few head scratching moments. But after cutting those gaps, all was back to normal. 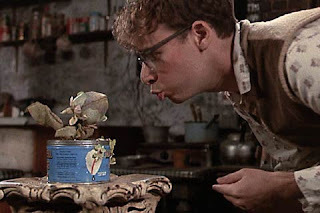 Also, some of the guard rails of my frogs were not electrically connected to the neighboring rails, causing a few unexpected stalls. I fixed those by soldering jumpers. People that solder their frogs and guard rails don't have this problem. I installed a Tony Trains Exchange On-Guard auto reverser circuit on one leg of the wye and added 9 Tam Valley Frog juicers to the turnouts. Both items are straight forward to install and worked great. The turnout to the siding for the bakery could not use a frog juicer. This was because a locomotive entering that frog will also trigger the frog juicer on the frog of the adjacent crossover. Frog juicers do not work well when two are tripped by a loco at the same time. To solve that problem, I added a manually operated SPDT toggle switch to handle the polarity on that frog to the fascia near that turnout. I added a switch plate on the fascia to help operators to remember to flip it when they also move the points. Fortunately, that turnout is only switched when accessing the siding, so it normally will be set for "main line." This is the only non-automatic polarity switching frog on the layout. Hopefully it won't cause too many operational errors. A better solution would be to add an under table mechanism, but that would require a new design as my current switch stands and point bridles are scale size and not easy to modify. Some lessons learned from this wiring exercise. 2. Follow a color code to keep track of polarity - I used "red to rear." 4. Wiring with bi-focals under the layout is tough. Bring a work light with you to better see under the bench work. My desk chair could be adjusted to allow sitting under the layout in some spots which helped make things more comfortable. 5. Testing DCC circuits with an Ohm meter can be tricky. Engines, especially battery powered, left on the tracks will measure as high resistance shorts. Best to remove all engines when debugging. With all the wiring done, it is time to do some testing, and that is on going. The wye works well. I have a few rough spots in the track-work that tuning and adjusting should help alleviate. I am thinking about modifying my links to prevent them from jamming when cars are backing. As long as the cars push coupler face to couple face they work well. But sometimes, the links jam in the pockets and don't allow the faces to touch. That can cause the cars to lift off the rails. I plan to make narrower links without the middle bar. Hopefully, that stops the derails that sometimes happen when backing up. Lachlan runs an engine into Falmouth while Garry videos. This evening Garry Glazebrook and Lachlan McGuire visited Alicia and I in Alexandria, VA.
Garry and Lachlan are from the Southern Highlands of Australia near Burradoo. Both Garry and Lachlan have layouts. Lachlan described his as "small" and currently stored in a shed, while Garry has an extensive model railroad called the Newcastle to Fassifern. It includes an large steel mill, a harbor area, and over 200 turnouts. Lachlan helps Garry with the wiring, a fact that would come in handy later. After a quick introduction to the layouts, they had a chance operate both Aquia Line and the PoLA. 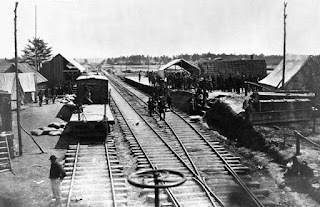 They had the honor of running the first train on the new tracks. Like most new operators, the double slip stub turnouts caused some confusion. Since the tracks at Aquia Landing are not yet fully wired, they ran a battery powered loco. They were the first operators to turn an engine on the wye at Aquia Landing! Lachlan discovered that the locos and cars were shorting as the crossed the boundary between the new booster we added last week and the old booster. Fortunately, Lachlan is a bit of a wiring guru. We spent about an hour debugging the problem. In the end we concluded that there was something wrong with the new booster. No matter how we wired its output wires it caused a short at the boundary. But otherwise it worked fine. At first we suspected that since they were from down under, that may be contributing to the short. But we eventually ruled that out. We could not find any crossed polarity feeders. We also could not find any feeders that would have been causing two boosters to feed one section of track. In the end, we removed the "new" third booster and reverted back to a two booster system - one for PoLA and one for Aquia. Then everything worked fine. This is another case of, "to err is human, but to really foul things up takes DCC." Anyway, it was a good test of the system. At least it is working now. 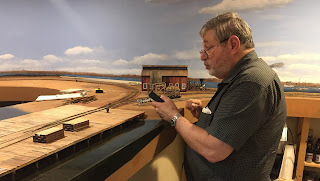 It was fun to compare notes with Aussie model railroaders. Perhaps we need to make a visit to the Land Down Under. Hopefully I haven't created my own little shop of horror, but last night I cut the last gaps for the frogs and soldered the last feeder to the track. I still have to connect the feeders to the buses and install the auto reverse circuit and frog juicers. I have a Tony's Trains exchange On Guard circuit for the autoreverse. These are no longer available, as they have an improved version. But I have one on the turntable in Falmouth and it works just fine. I'll get to the cow later, but today we had a very productive work session. Eight members of the USMRR construction corps showed up to work. Mat Thompson and Pete LaGuardia arrived first. 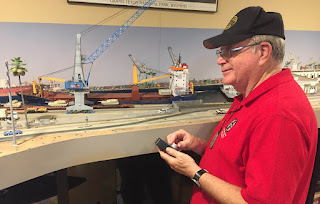 They went to work installing the booster to the Aquia Landing section of the layout. I had previously run the main power buses to Aquia Landing, so just they needed to swap out the wires at the main junction panel. I thought this job would take a few hours, but Pete and Mat finished in less than an half hour. We even tested it by shorting a section, and as designed, the other sections continued to work. 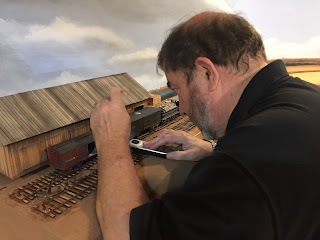 With the booster connected, Mat went to work installing wooden joint bars to the finished part of the layout, while Pete started drilling holes and adding feeders to the tracks at Aquia Landing. Pete was the model of efficiency as he got all the feeders installed and soldered. Next "Loco" Leonard White and John Salmons arrived. They immediately went to work spiking track at the wye in Aquia Landing. Over the past week I had finished all the spiking of the new track at Burnside's wharf. With Loco Len and John's work, there are only about 6 or 7 feet of spiking left to do. Whew! are those B&M cars doing there? Next, John "I read the email and brought my Floquil Pen" Drye arrived. He went to work painting track. Unfortunately, his paint pen was dried up, as were all of mine. So he ended up painting with a brush and acrylic paint. Later I fired up the airbrush and got busy painting rails with Vallejo acrylic paint. Next to arrive was John Barry (yes that is the third John if you are keeping score). He went to work with Mat adding joint bars. After about an hour or so they used all the joint bars I had prepared. I need to cut some more on my laser. JB Weilepp (no one knows if the "J" in "JB" stands for John. If so, that makes 4 Johns) arrived. He had worked on a box car kit at home. Earlier in the week, Paul Dolkos also brought over a box car kit that he had worked on. With the one I built, and two more flat cars, we now have 5 more cars in various states of partial assembly. JB had to leave, but he took another kit home to work on. Doug Gurin was the last to arrive. At about the same time my mom showed up with a delicious home-made carrot cake. It didn't take long for the work crew to desert their posts for dessert. After a tasty snack, I managed to get the crew back to work. Doug took over rail painting duties as JD had to leave. I worked on planking the area between the tracks on the wharf. John Barry helped. By 5PM, we broke for dinner. Doug and John Barry stuck around for dinner. During the dinner conversation we learned that John Barry not only has a pet horse, which we knew about, but he also has a pet cow. The cow came with the house that he bought in rural Virginia. And to top it off, the cow got pregnant and now John has a calf. How the cow got pregnant when John does not have a bull is a story for another time, but not to worry, it was not an immaculate conception. Of course my mom immediately suggested eating John's pet calf. Even Doug seemed to favor the idea of eating fresh veal. Geeze, tough crowd! All in all a great work session. Thanks guys. It took eight years, but I can finally breathe a sigh of relief as I am done with track laying on the Aquia Line. This evening I installed the last turnout including the switch stand. It all works well. It seems to be one of the smoothest turnouts yet. I still have some spikes to install, but for now we can declare victory on the track work. I also finished adding the tracks to the sidings at Burnside's Wharf. I made a new jig using my laser to help spike the straight sections. That worked much better than I expected. It's too bad I am done with track work as I was just starting to get the hang of hand laying. In total there are 23 turnouts, about 140 feet of mainline, about 210 total linear feet of track, 6000 ties, and 24,000 spikes. Clear acrylic straight track spiking fixture. Next is wiring and electrical gap cutting. I need to add an autoreverse on one leg of the wye. I also plan to add frog juicers to the turnouts. Most of my engines have either batteries or keep alive circuits, but I do have one engine that is just DCC with sound. That one would definitely benefit from Frog Juicers, which are easy to install. The Frog Juicers will keep the other engines running well too.